I recently had the opportunity to inspect "Nuberu Blau" a 40M Alloy SY currently undergoing a refit at Rybovich in West Palm Beach. Alloy's reputation as a world class builder is well known and "Nuberu Blau" is another example of their quality construction and impeccable detail. 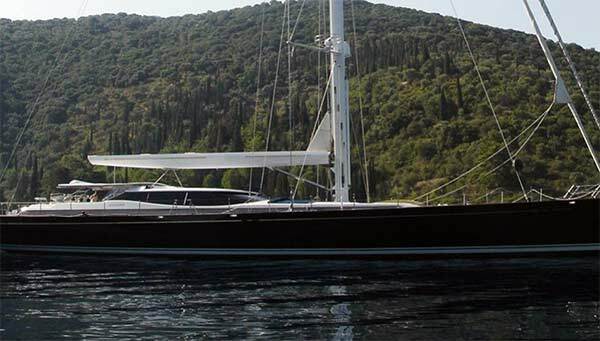 "Nuberu Blau" is the 7th in a series of collaborations between Dubois Naval Architects and Alloy Yachts. 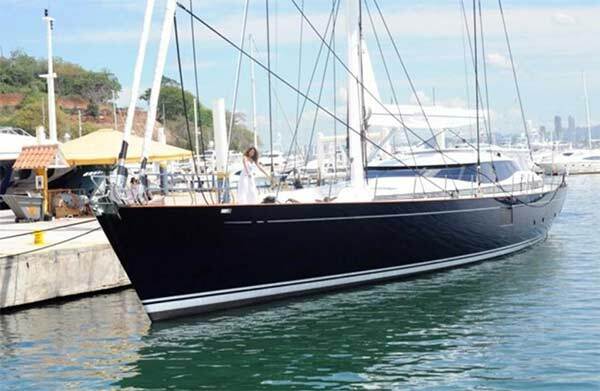 Originally launched as "Kokomo" in 2000 "Nuberu Blau" is an exceptional performer and whether cruising or racing she has demonstrated an outstanding combination of comfort, speed and safety. Dubois spent a great deal of time developing the hull-shape and underwater foils of this design. 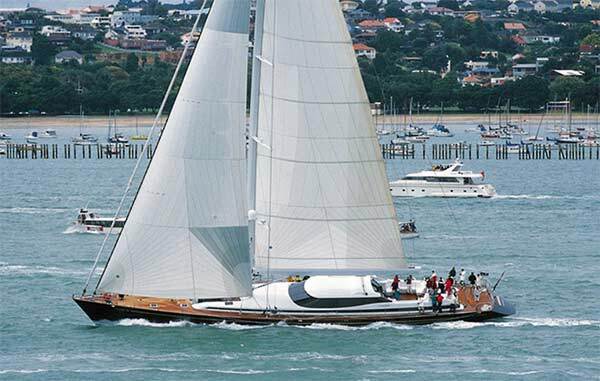 The research and testing at the Wolfson Unit at Southampton University, where Team New Zealand tests its America's Cup designs, resulted in an extremely efficient sailing yacht. Her numbers show an excellent lift to drag ratio with high stability, and high aspect ratio foils give her superior maneuverability. While great emphasis was put on the performance of this design; creature comforts, esthetics and functionality did not take a back seat. "Nuberu Blau" is absolutely georgous with very clean graceful lines. She is a deck saloon design which features a very low profile house, large entertainment cockpit and a twin helm arrangement. Each helm has duplicate sail controls and instruments. 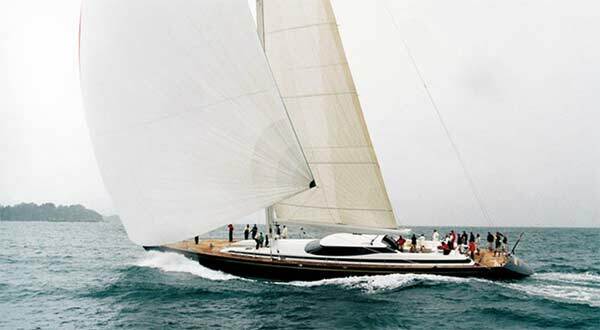 All sailing functions are controlled by hydraulic winches and furlers and sheeting is handled by captured reel winches which are recessed in deck lazarette lockers. 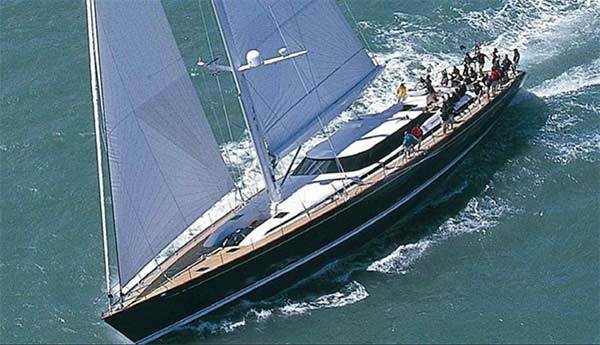 There are 2 halyard winches at the base of the mast and a pair of winches aft for runners and MPS. This makes for a very clean deck layout with few toe stubbers and easy access fore and aft. The spars are carbon fiber and were stripped and painted in 2010. New PBO carbon fiber standing rigging and Dyneema running rigging were replaced at the same time. 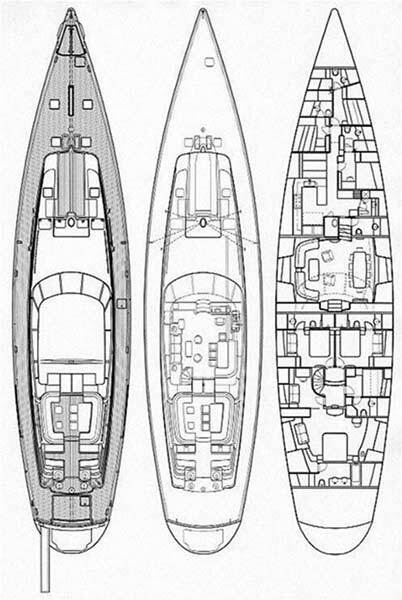 A new suit of sales were also part of the refit and include main, genoa and blade. 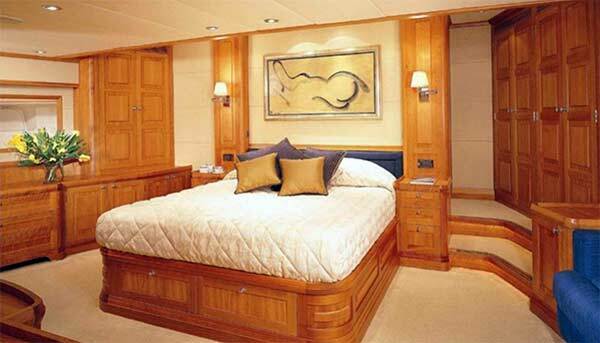 The interior layout has guest accomodations for 8 in 4 staterooms with 3 additional double cabins forward for crew. Access to the guest quarters is by a staircase at the aft end of the upper saloon which decends to a foyer with beautiful Bubinga rosewood sole and custom walnut cabinetry. The full beam master with ensuite is located aft and features an adjoining office space which can be separated from the master with a pocket door. To starboard from the foyer is a small double cabin with ensuite, forward from the foyer are mirror image double guest cabins port and starboard each with ensuites. 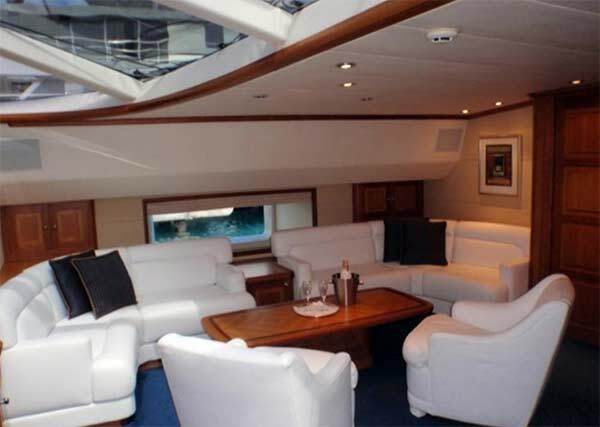 The upper saloon has a dinette to starboard with nav desk and chair forward and settee to port. 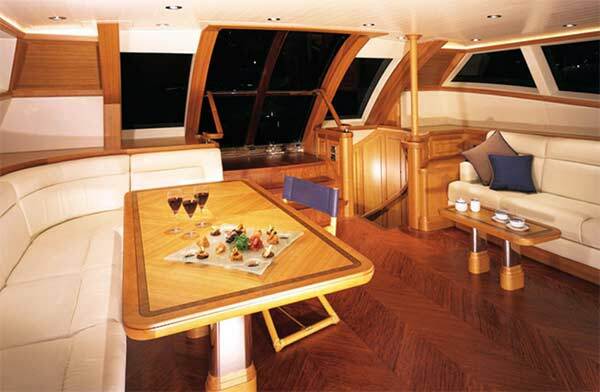 Stairs forward lead down to the lower saloon which has a large formal dining table to starboard and wrap around settee and floating chairs to port. 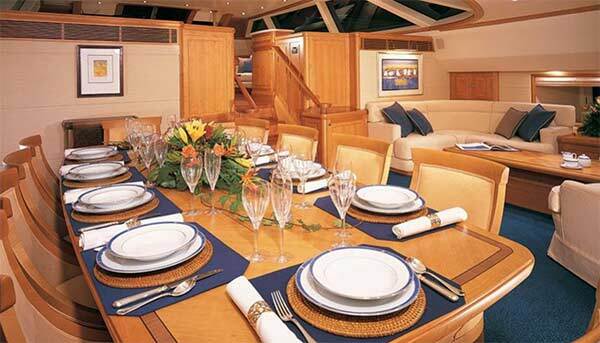 Forward from the saloon is the galley, crew mess and crew quarters all with ensuites. The interior joinery is beautifully executed in cherry woods with raised panels and radiuses everywhere. The finish is in amazingly good condition and belies her age. Even behind the scenes you see the attention that has been lavished on her as the entire bilge area stem to stern has been Alwgrip painted and is immaculate. "Nuberu Blau" went through an extensive refit in 2010 and along with the spar, rigging and sails updates a new main engine was installed, along with new gen sets, new communication and navigation equipment, new galley refrigeration and the hull topsides were Alwgrip painted. Current updates include all new A/C chillers, full service to hydraulic systems, gen set rebuild, teak deck maintenance and full bottom maintenance including bottom painting and audio gauging. Everything is being attended to and she will be fit and ready for a new adventure. "Nuberu Blau" represents a unique opportunity for anyone looking at large sail. 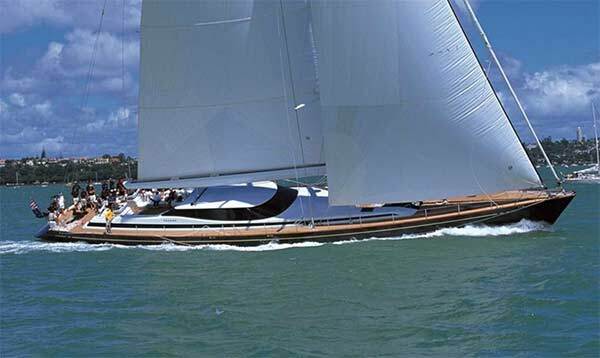 There simply isn't anything on the market today that compares in this class/price range and there is no finer pedigree than Alloy in superyacht sail.